Papell with Love: PPP - March 2018 Release Blog Hop! Hello Everyone, welcome to the second day of Pretty Pink Posh March 2018 Release Blog Hop!If you are joining the hope you should have arrived at Terri Anderson's Blog. For this project I used the new Cherry Blossom stamp set, Cherry Blossom Coordinating dies, Happy Easter Shaker die, Pink Blush Jewels, and Buttercream Jewels. To begin, I first distressed my card base with Distress Ink in Tattered Rose. I also die-cut the Happy Easter Shaker die few times and stacked and glue them on top of the other. I also stamped the sentiment "happy spring" from the new Bunny Friends stamp set. 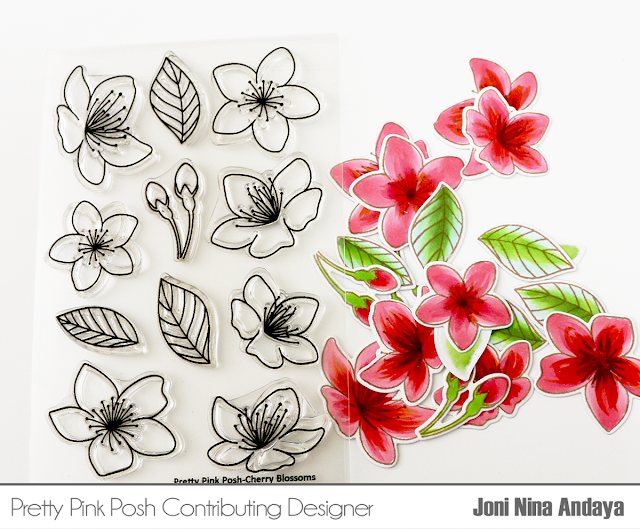 Next, I stamped and die-cut my flower images using Cherry Blossom stamp set and Cherry Blossom Coordinating dies. Then colored them with Copic Markers. Next, I adhered the flowers and leaves with foam taped for dimension. I added the Pink Blush Jewels, and Buttercream Jewels to finish off the card. Just another final look of the finish card. I hoped you enjoyed! Thank you for stopping by! Your next stop will be on Thi Lam's Blog. What a delightful card...colors, design, sentiment...it's lovely!!! this card is gorgeous! Love your color choices along with those jewels! Yeah, I'm getting the cherry blossom set! Wow! I'm totally in love for this darling card!! !Your colouring is simply gorgeous!!! I love how you made a wreath of the gorgeous flowers. That is a stunning card. Both cards are lovely! How clever using the Happy Easter Shaker die cut as the base of the wreath! Clever, clever! Your card is so beautiful! I love the softness of it. Wonderful set of cards, but wow to your floral card. Fabulous colors and coloring. Love how you foam mounted them for dimension. Your first card should make someone very happy! Beautiful! What a stunning card, I love the pop of red! Beautifully designed and executed! Thanks so much for sharing and inspiring! Love your beautiful card Joni! Such pretty cards! Thank you for sharing with us! These cards are beautiful. 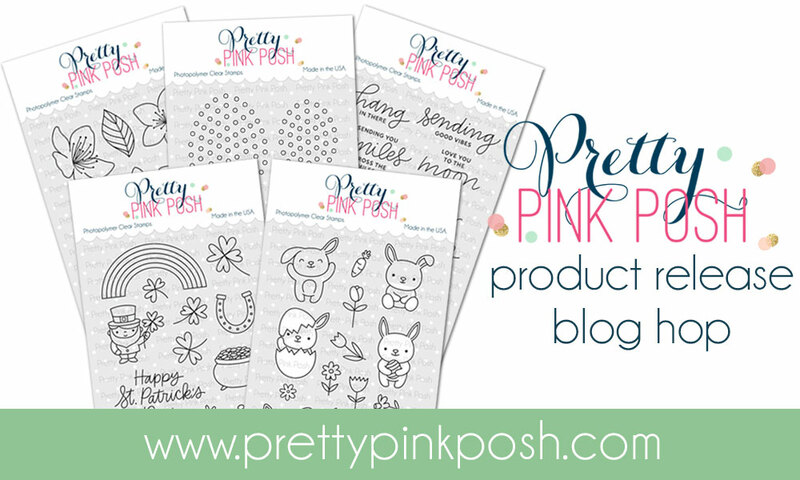 With each blog, I see more stamps and dies I absolutely NEED! Beautiful!! The jewels on the flowers really pop! So pretty! Your cherry blossoms are lovely. I love how you made a wreath around the sentiment. Pretty spring card suitable for Easter as well. Such a beautiful card! Love the new release. Very pretty! I very much like your choice of colours here. Your cards are always so pretty!! Awesome colors and layouts! I really love the flower color coordination on the happy spring card! Welcome spring!! Love your flowers. Beautiful cards. I am loving how you used the die egg and placed the AWESOME flowers around it to make a wreath style. I am loving the colors I am seeing these AWESOME flowers being colored. So many wonderful looks. I have this on a wish list. Beautiful cards. They are making me crave Spring desperately! Love this release! Beautiful card! Very pretty floral wreath using the Happy Easter shaker die. Your coloring on the flowers is gorgeous! I can't believe you can achieve such depth with your Copics - so talented! Beautiful cards Joni, thanks for sharing! The Cherry Blossom card is gorgeous! I love the dark rich colors you used. Amazing colors !!! So vibrant, really love this release ! 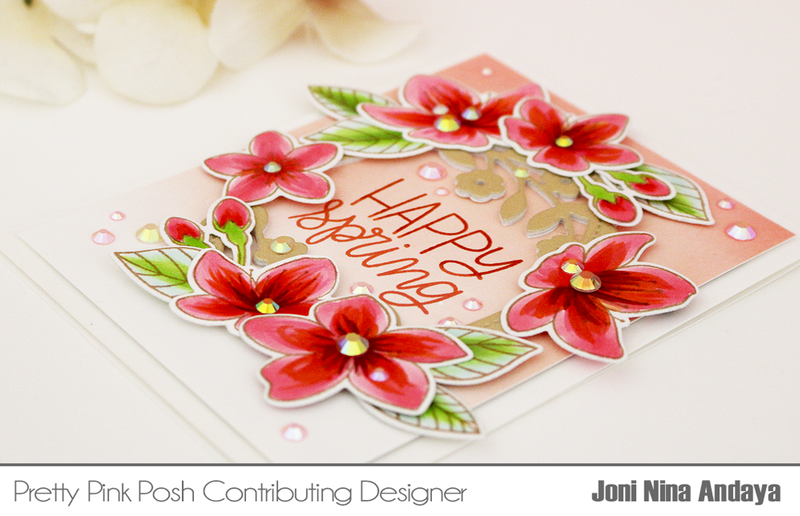 Joni, your Cherry Blossom card is stunning and the Happy Spring card is awesome as well. I love how you altered the die cut to use it for another occasion. As beautiful as it is, its always nice to stretch our products and get more bang for the buck. Oh my goodness!!! this is stunning. Absolutely stunning. I love all of your colors used. Well done! Lovely cards; I especially love the cherry blossom wreath and your beautiful coloring! Oh wow! Such a beautiful card. :) Enjoyed your step by step instructions on how you created it. Thanks so much for sharing! 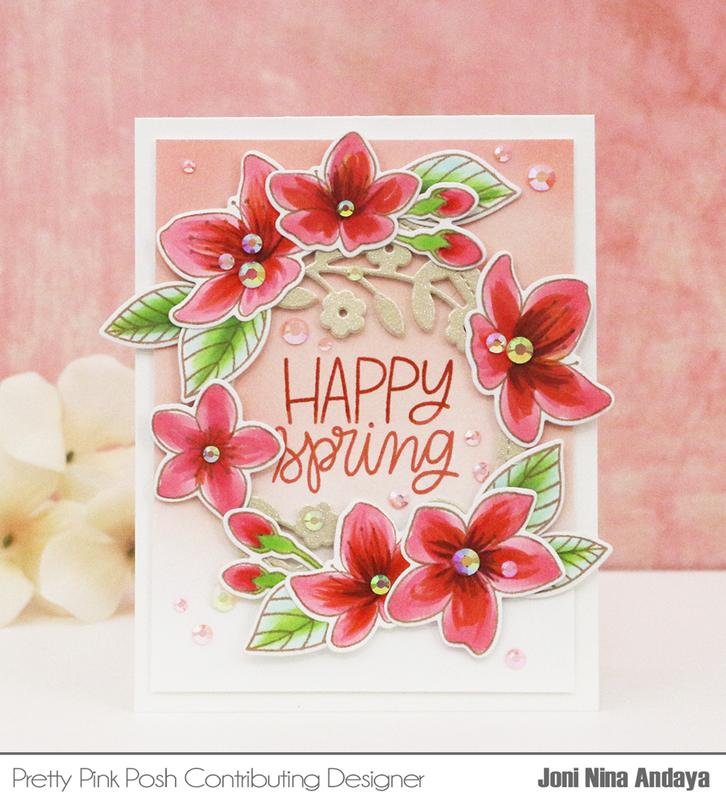 Beautiful card...those blossoms are amazing. Love your creative and beautiful card. Love the cherry blossoms and how you laid them out on the shaker die! Such a creative idea, and the jewels match so well with your beautifully colored flowers! Great ideas! I like how you used the new products! Thanks for sharing. A beautiful card! Love your design, coloring, and embellishment! Thanks for sharing your creativity. Wow! Super beautiful card! Love it! You did a fabulous job with the different products in this release. Fabulous idea to use the shaker die to make your wreath! Gorgeous card with lovely coloring! Congrats to PPP on an awesome release! The flowers and their background is fantastic. Genius!! Love how you used the easter egg die as a frame! So perfect! Your cherry blossoms are beautiful!! Wow! Those flowers are gorgeous! And I like the way you left the white space on the leaves, that looks really cool. Great cards. I especially love the first one -- absolutely gorgeous. Ooooh I just absolutely love the coloring on the cherry blossoms! They're my favorite flowers and I just love what you did to them! Lovely card! I love the bit of shimmer on the egg frame, lovely home for the beautiful blooms. Gorgeous card with lovely color! Those flowers are so pretty!! Beautiful card! 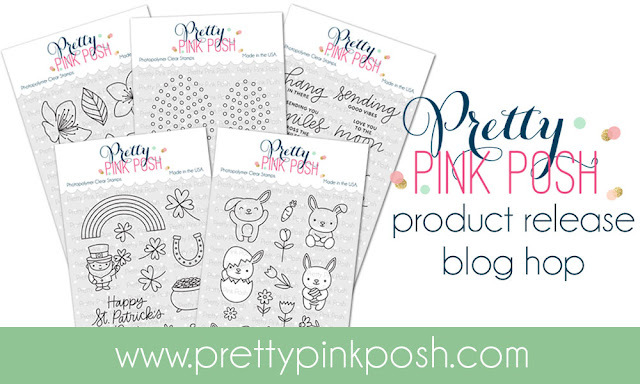 Love all these new dies and stamps from PPP. your cards are so brilliant & bright! very inspiring!! Your wreath is so gorgeous ! I've seen this on a couple different people's blogs, but I love how the delicate cherry blossoms can so easily be turned into tropical flowers with just a little bit of different coloring. I love all the layers of flowers from the die cuts and the colored flowers and leaves on your card. Such a beautiful use of the new release. Thanks for sharing! Love your post Joni. I like the cross stitch border.